It is truly a great pleasure to welcome President Putin to India. We have met twice at the opposite ends of the world - in Brazil and Australia. I am honoured to host him in Delhi for the annual Summit. Since the turn of the century, he has been a key architect of our partnership. President Putin and Prime Minister Vajpayee launched the annual Summit process in 2000. When Prime Minister Vajpayee held the first of summits in Moscow in November 2001, I was there to sign the sister-state agreement between Gujarat and Astrakhan. President Putin is a leader of a great nation with which we have a friendship of unmatched mutual confidence, trust and goodwill. We have a Strategic Partnership that is incomparable in content. The steadfast support of the people of Russia for India has been there even at difficult moments in our history. It has been a pillar of strength for India`s development, security and international relations. India, too, has always stood with Russia through its own challenges. The character of global politics and international relations is changing. However, the importance of this relationship and its unique place in India`s foreign policy will not change. In many ways, its significance to both countries will grow further in the future. Russia has been India`s foremost defence partner through decades. My first visit outside Delhi as Prime Minister was to our new aircraft carrier, INS Vikramaditya. It sails our seas as a great symbol of our defence cooperation. Even as India`s options have increased today, Russia will remain our most important defence partner. We have conducted joint exercises across all three wings of the Armed Forces in the last six months. President Putin and I discussed a broad range of new defence projects. We also discussed how to align our defence relations to India`s own priorities, including Make in India. I am pleased that Russia has offered to fully manufacture in India one of its most advanced helicopters. It includes the possibility of exports from India. It can be used for both military and civilian use. We will follow up on this quickly. I also proposed that Russia should locate manufacturing facilities in India for spares and components for Russian defence equipment in India. He responded very positively to my request. Energy security is critical for India`s economic development and creating jobs for our youth. Russia is also a key partner in this area. I am pleased that the first unit of the Kudankulam Nuclear Power Plant is on stream. It has added 20% to the existing capacity for nuclear power in India. We are on course for installing the next three units of 1000 MW each. Today, we have outlined an ambitious vision for nuclear energy of at least ten more reactors. It will have the highest standards of safety in the world. It will also include manufacture of equipment and components in India. This also supports our Make in India policy. 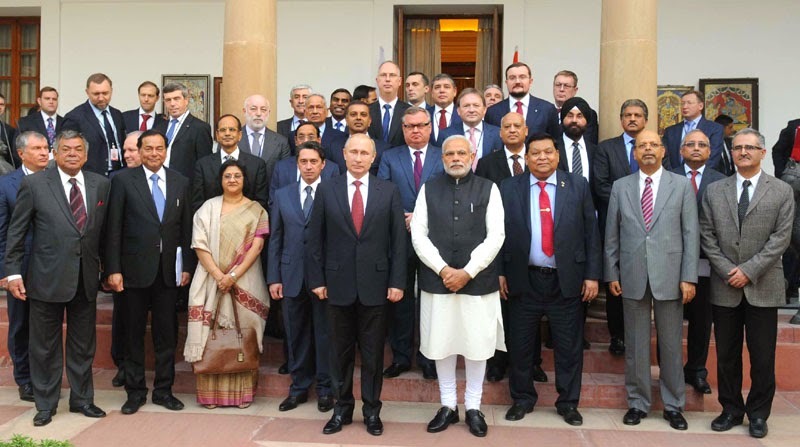 Russia is the world`s top source for hydrocarbon resources; and, India one of the world`s largest importers. Yet, despite our close friendship, our collaboration in this sector has been disappointing. Today, we have made a new start with a few important agreements. But, we will set an ambitious agenda for partnership in oil and natural gas. Today we have taken a number of decisions and signed several agreements. They also reflect our shared belief that in today`s world, vibrant economic relations constitute a key pillar of a strong strategic partnership. Similarly, closer contacts between people and in areas like education, culture and tourism are important. I thank President Putin for his support for India`s closer relations with Eurasian Economic Union. The International North South Transport Corridor will connect us better. And, today, we will jointly visit the World Diamond Conference. This highlights our new innovative approaches to strengthening economic relations. President Putin and I agreed that this is a challenging moment in the world. Our partnership and the strong sensitivity that we have always had for each other`s interests will be a source of strength to both countries. I conveyed my deepest condolences for the loss of lives in the terrorist attack in Chechnya. This also reflects our many shared challenges. Our areas of priority for our cooperation include combating terrorism and extremism; advancing peace and stability in Afghanistan; working together for a stable, balanced, peaceful and prosperous Asia Pacific; and, cooperating for development in other countries. Institutions like BRICS, East Asia Summit and G 20 have also widened our framework of engagement. This is President Putin`s eleventh Annual Summit and my first. This Summit reinforced my conviction in the extraordinary value and strength of this partnership. I am confident that our bilateral cooperation and international partnership will acquire new vigour and scale new heights in the years ahead.